On to some long thought about garment sewing with a touch of Spring. This jacket is going to be a knockoff of this Dolce & Gabana jacket that I fell in love with last fall. My version will have shoulder princess seams but only a center back seam in the back. The sleeves will be two piece. The charmeuse lining will be quilted to the jacket as in the original and I haven't quite worked out the the seam situation yet. The seams appear to be bias silk and rather sloppy, I might add! I think I will do a raw edge. The front of this jacket has a small double breast and collar. I am using Simplicity 2284, View D, which meets at center front and no collar. So a wee bit of drafting will take place here. I may morph something from another pattern to pull this off. In the meantime I worked up a muslin this morning. This jacket is one of the "cup" patterns. I did a size 6, C cup, and morphed to 12 at the hips. For the construction I will block fuse the boucle to some Pam Erny interfacing, I believe its a weft insertion, light weight. It's actually yummy. I am not doing a full blown Chanel here but will use a few techniques as I see fit. This will evolve, but I have a much better handle on this evolution than I did on the slipcover! So I am feeling confident it will work out nicely. I just have to try some seam samples. Glad you all liked the slipcover project. It was stressful and a great learning experience. You have to be open to new techniques and you have to stick with them. How else would we learn? Thanks for all your lovely comments. I am so not a wadder person. I just feel that my efforts have a value and it behooves me to see things through to the end. Nuff philosophy! That will be a gorgeous jacket. The bound edges and seams are an interesting detail. Safe trip. I think your throne is just lovely! And I cannot wait to see how the jacket progresses! This will be gorgeous. The fabrics are lovely! 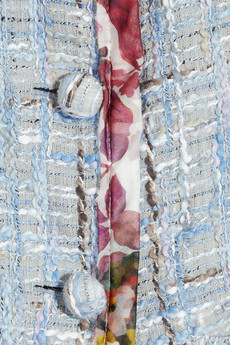 I am so intrigued with the floral edging with the textural fabric- very inspiring. I'm gathering my popcorn and a cozy chair to watch your progress! I remember that jacket and it's a standout. I can't wait to see your version. ohhhhh nice looking jacket - I am not a great one for doing muslin's perhaps my results would be better if I did. That looks really good. Great inspiration jacket. And I am with you on avoiding wadders at almost all cost. I love your jacket! I also have similar fabric - of course, mine is blue and it's a silk weave! :) I wish I was brave enough to try a jacket. Maybe as I watch you work on yours, I'll think about trying mine. I know you'll be making a lovely version of this jacket! I love the seam detail! Kathy, IMO, if you start with a shoulder princess seam style, I think you can fit anyone. There are just so many opportunities for fit. I like the shoulder princess seams on the back. This pattern didn't have that detail but it did offer a center back seam for adjustment. I did do my usual swayback adjustment on it. One thing I noticed about this pattern is that the side seams are set more toward the back. I like that. I love the colors you chose for the jacket. What is the fiber content of the boucle? I agree, those seams do look a bit sloppy. Maybe they just need to be sewn in correctly. Have a great trip! The boucle is a cotton/acrylic blend. I think I have decided how to do the seam embellishment so more to come on that shortly. We all know you can do a better job on those seams than Dolce & Gabana!!! You could probably teach them a thing or two! I LOVE, LOVE, LOVE the fabrics you've picked....PREEETTTYYYY!! Very Spring-like & we're all anxious for some of that. Talk to you when you get back home. Love that jacket! What a great job and what wonderful inspiration! Perfect for Spring!